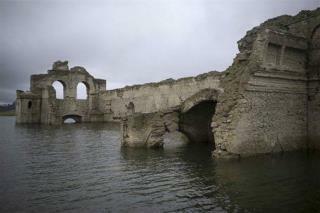 (Newser) – Huh, this wasn't there last year—a 16th-century church emerging from the waters of a Mexican reservoir. But it actually makes sense, because drought has caused the water level to fall 82 feet in the Nezahualcoyotl reservoir, revealing a church that was flooded during construction of a dam nearly 40 years ago, the AP reports. Known as the Temple of Santiago, the building is about half-way visible in the watershed to the Grijalva river. This isn't the first time the church has resurfaced: In fact, the water level got so low in 2002 that people could actually walk inside: "The people celebrated. They came to eat, to hang out, to do business. I sold them fried fish," says a fisherman who's now offering Temple of Santiago boat tours. WHAT!!! Do you mean to tell me people had slaves other than white Southerners in the United States. Damn most people do not know that. Um, so they built a reservoir around a building that contained an ossuary of plague victims?